Merton provides an overview and synthesis of finance theory from the perspective of continuous-time analysis. He covers individual financial choice, corporate finance, financial intermediation, capital markets and selected topics on the interface between private and public finance. The volume is based around Merton’s most significant essays, which he has brought up to date with postscripts, and new chapters on recent developments in portfolio theory, option and other derivative security pricing, financial intermediation, capital asset pricing, and general equilibrium analysis. 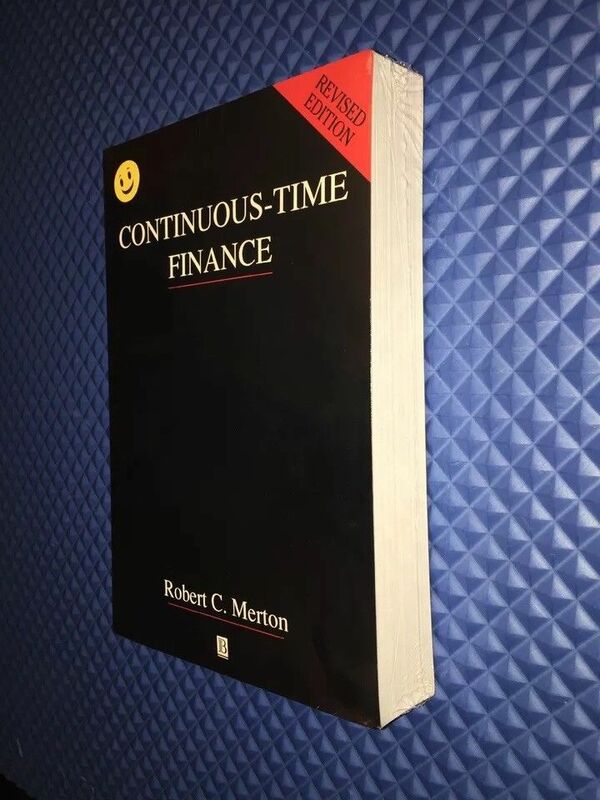 Robert C. Merton’s widely-used text provides an overview and synthesis of finance theory from the perspective of continuous-time analysis. It covers individual finance choice, corporate finance, financial intermediation, capital markets, and selected topics on the interface between private and public finance. Foreward: Paul SamuelsonPart I: Introduction to Finance and the Mathematics of Continuous-time Models:1. Modern Finance.2. Introduction to Portfolio Selection and Capital Market Theory: Static Analysis.3. On the Mathematics and Economic Assumptions of Continuous-time Financial Models.Part II: Optimum Consumption and Portfolio Selection in Continuous-time Models:4. Lifetime Portfolio Selection under Uncertainty: The Continuous-time Case.5. Optimum Consumption and Portfolio Rules in a Continuous-time Model.6. Further Developments in Theory of Optimal Consumption and Portfolio Selection.Part III: Warrant and Option Pricing Theory:7. A Complete Model of Warrant Pricing that Maximizes Utility.8. Theory of Rational Option Pricing.9. Option Pricing when Underlying Stock Returns are Discontinuous.10. Further Developments in Option Pricing Theory.Part IV: Contingent-Claims Analysis in the Theory of Corporate Finance and Financial Intermediation:11. A Dynamic General Equilibrium Model of the Asset Market and its Application to the Pricing of the Capital Structure of the Firm.12. On the Pricing of Corporate Debt: The Risk Structure of Interest Rates.13. On the Pricing of Contingent Claims and the Modigliani-Miller Theorem.14. Contingent Claims Analysis in the Theory of Corporate Finance and Financial Intermediation.Part V: An Intertemporal-Equilibrium Theory of Finance:15. An Intertemporal Capital Asset Pricing Model.16. A General Equilibrium Theory of Finance in Continuous Time.Part VI: Applications of the Continuous-Time Model to Selected Issues in Public Finance:17. An Asymptotic Theory of Growth Under Uncertainty.18. On Consumption-Indexed Public Pension Plans.19. An Analytic Derivation of the Cost of Loan Guarantees and Deposit Insurance.20. On the Cost of Deposit Insurance when there are Surveillance Costs. Foreward: Paul Samuelsonart I: Introduction to Finance and the Mathematics of Continuous-time Models:. Modern Finance.Introduction to Portfolio Selection and Capital Market Theory: Static Analysis.On the Mathematics and Economic Assumptions of Continuous-time Financial Models.art II: Optimum Consumption and Portfolio Selection in Continuous-time Models:. Lifetime Portfolio Selection under Uncertainty: The Continuous-time Case.Optimum Consumption and Portfolio Rules in a Continuous-time Model.Further Developments in Theory of Optimal Consumption and Portfolio Selection.art III: Warrant and Option Pricing Theory:. A Complete Model of Warrant Pricing that Maximizes Utility.Theory of Rational Option Pricing.Option Pricing when Underlying Stock Returns are Discontinuous.0. Further Developments in Option Pricing Theory.art IV: Contingent-Claims Analysis in the Theory of Corporate Finance and Financial Intermediation:1. A Dynamic General Equilibrium Model of the Asset Market and its Application to the Pricing of the Capital Structure of the Firm.2. On the Pricing of Corporate Debt: The Risk Structure of Interest Rates.3. On the Pricing of Contingent Claims and the Modigliani-Miller Theorem.4. Contingent Claims Analysis in the Theory of Corporate Finance and Financial Intermediation.art V: An Intertemporal-Equilibrium Theory of Finance:5. An Intertemporal Capital Asset Pricing Model.6. A General Equilibrium Theory of Finance in Continuous Time.art VI: Applications of the Continuous-Time Model to Selected Issues in Public Finance:7. An Asymptotic Theory of Growth Under Uncertainty.8. On Consumption-Indexed Public Pension Plans.9. An Analytic Derivation of the Cost of Loan Guarantees and Deposit Insurance.0. On the Cost of Deposit Insurance when there are Surveillance Costs. Foreword by Paul A. Samuelson.Preface..Part I: Introduction to Finance and the Mathematics of Continuous-time Models:.1. Modern Finance.2. Introduction to Portfolio Selection and Capital Market Theory: Static Analysis.3. On the Mathematics and Economic Assumptions of Continuous-time Financial Models.Part II: Optimum Consumption and Portfolio Selection in Continuous-time Models:.4. Lifetime Portfolio Selection under Uncertainty: The Continuous-time Case.5. Optimum Consumption and Portfolio Rules in a Continuous-time Model.6. Further Developments in Theory of Optimal Consumption and Portfolio Selection.Part III: Warrant and Option Pricing Theory:.7. A Complete Model of Warrant Pricing that Maximizes Utility.8. Theory of Rational Option Pricing.9. Option Pricing when Underlying Stock Returns are Discontinuous.10. Further Developments in Option Pricing Theory.Part IV: Contingent-Claims Analysis in the Theory of Corporate Finance and Financial Intermediation:.11. A Dynamic General Equilibrium Model of the Asset Market and its Application to the Pricing of the Capital Structure of the Firm.12. On the Pricing of Corporate Debt: The Risk Structure of Interest Rates.13. On the Pricing of Contingent Claims and the Modigliani-Miller Theorem.14. Contingent Claims Analysis in the Theory of Corporate Finance and Financial Intermediation.Part V: An Intertemporal-Equilibrium Theory of Finance:.15. An Intertemporal Capital Asset Pricing Model.16. A General Equilibrium Theory of Finance in Continuous Time.Part VI: Applications of the Continuous-Time Model to Selected Issues in Public Finance:.17. An Asymptotic Theory of Growth Under Uncertainty.18. On Consumption-Indexed Public Pension Plans.19. An Analytic Derivation of the Cost of Loan Guarantees and Deposit Insurance.20. On the Cost of Deposit Insurance when there are Surveillance Costs.21. Optimal Investment Strategies for University Endowment Funds.Bibliography.Author Index.Subject Index.